is to breed them to know the boundaries of your land. and somehow, for generations, flocks stay put. and swallowing each loop as a tightening belt. The smell I’ve caught of myself, sheep like. Daedalus, riddle me out of my body and into the fold. Make me unctuous in lanoline with hair kinked as wool. a limit line for the want of these children. nothing of more weight, off-white in the sallow field. but never the monster who got it. 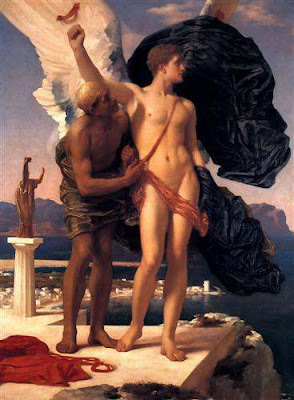 Daedalus pushed his nephew, Perdix, off a cliff and called it an accident. The small boy had shown a knack for inventing, too. He made a saw of a snake's jaw, a compass from two bound rods. There is always ever room for only one genius. invent as you would an axe or a sail, another myth. Say the boy became a partridge. That low flying bird who nests never far off the ground. Say whatever happened, we slept through it. the dried and crushed powder from the swim bladders of fish. who kept spool and plummet in his pockets. See how it is a weighted object and string, my want. wax, and glue. But to drop exacting from the sky or into the deep is the work of gods. There is no measure for that buoyant line between child and god and me.